Deciding what plants for your window boxes can be intimidating. After all, there is a lot to consider when you’re expecting a plant grouping to be the finishing touch to your exterior decor. So, before you go shopping, take some of the guesswork out by following my guide to achieving a top-notch window box for your home. 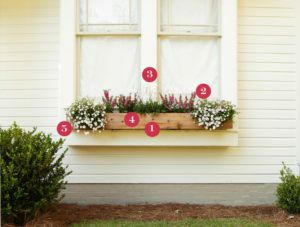 1: Start with the box: If you don’t have a window box yet, this is the place to start. Measure your window and make sure the box reaches to the outer corners so the scale is right. I like to contrast the window box material with the house material. For example, on a brick house, maybe choose a painted look PVC box or even an iron window box. For painted homes, a dark colored PVC box or a durable cypress wood box would add interest, as shown in the photo here. 2: Choose a color scheme: Everyone has a color scheme they naturally lean toward. Know what colors you like and, while you shop, put them together in your cart and step back to see if you like how they look together. It’s easy to get carried away with all the beautiful blooms, but be honest with yourself before you buy. Taking a photo with your phone and viewing it within the frame of your screen will help you to see the plants as a group without any distractions. I chose white, light pink, and magenta for this window box display. 3: Add height: Plantings that are flat across the top can be boring to the eye. Use height in the center or on the ends of the planter to create an interesting composition. Before you leave the store, make sure you get a plant that will act as height for your window box composition. For this example, I used height in the center of the window box. 4: Don’t reinvent the wheel: A good trick to establishing a window box planting that is easier to maintain next season is to use evergreen or perennial plants. You don’t have to use these exclusively, and I’d recommend using annuals mixed in, but using evergreen or perennials (plants that will come back next year) will save you from having to buy and plant as many things next year. I used a perennial called gaura for the window box design shown here. 5: Get Low: We talked about height, but what’s happening at the bottom of the window box? Soften the edges and the sides and front of the box with a plant that spills over the edges. It can be flowering, have interesting leaves, or can even be one of your evergreen or perennial choices – but make sure you have something spilling over the edge. For this example, I used cascading petunia in light pink.